"Once in his life a man ought to concentrate his mind upon the remembered earth, I believe. He ought to give himself up to a particular landscape in his experience, to look at it from as many angles as he can, to wonder about it, to dwell upon it. 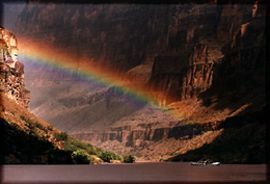 He ought to imagine that he touches it with his hands at every season and listens to the sounds that are made upon it. He ought to imagine the creatures there and all the faintest motions of the wind. He ought to recollect the glare of noon and all the colors of the dawn and dusk." 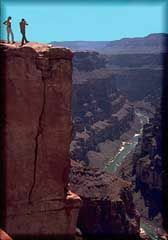 Looking at the Colorado River from the rim east of Toroweap Point, above River Mile 175. 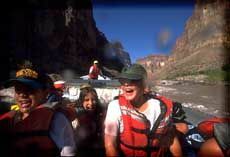 Passengers enjoying a wet ride on a motor rig in lava Falls Rapid. 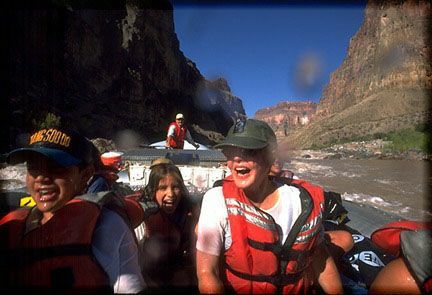 With a 37 foot drop, lava Falls is the largest navigable drop in North America. 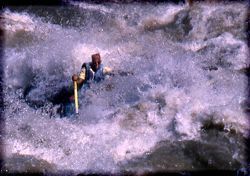 Lava Falls Rapid, Mike Sneed at the oars. 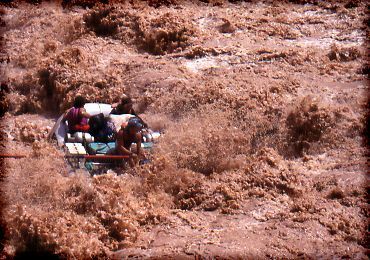 Another shot of lava Falls; Michael Kaye rows through...yes, there is a boat and another person under all that whitewater! 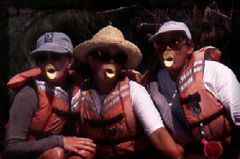 River passengers discover that leftover Pringles potato chips make great "duck lips"! 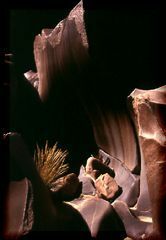 The Vishnu Schist (the oldest rock in the Canyon; 2.5 billion years old!) is especially beautiful in spots like this where it's been sculpted into sinuous forms. Mile 242.